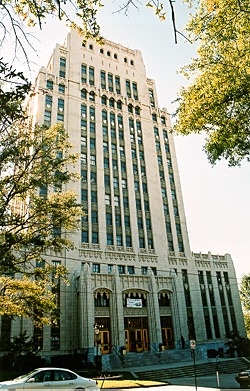 Atlanta City Hall, completed in 1930, is a fine example of a Neo-Gothic government building. The Atlanta City Hall is an 11-story tower set on a four story rectangular base, with pointed arches and uninterrupted piers. The reinforced concrete building has a cream-colored terra cotta veneer covering the entire building. There are white marble balustrades and steps at the Mitchell Street entrance. The lobby and other public spaces have decorative marble wainscoting, walls, and pillars, and ornamented plaster cornices. Prominent local architect G. Lloyd Preacher, who moved to Atlanta from Augusta, Georgia in 1922, designed Atlanta City Hall. Preacher designed many buildings in Atlanta and throughout the Southeast. 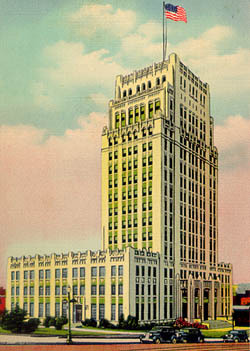 Among his designs in Atlanta are the Wynne-Claughton (Carnegie) Building, the Pershing Point Apartments/Hotel, the Medical Arts Building, and the McGlawn-Bowan (Standard) Building. place in this building. Mayor William B. Hartsfield called upon the legislature to desegregate Atlanta's schools without State intervention, and Maynard Jackson became the first African American elected mayor of any southern city since reconstruction. Three city halls existed in Atlanta prior to this one, the first (1855-1882) being located directly across the street from this building, on the current site of the Georgia State Capitol. The second City Hall was located at Pryor Street and Martin Luther King, Jr. Drive in a building owned by the Atlanta Chamber of Commerce (1882-1911). The third City Hall was located in the U.S. Post Office and Courthouse (1911-1930). The current location was originally the site of a private home and later a girl's high school until the city purchased the land in the 1920s for the site of the future City Hall. The main offices of City Hall remained at this location until March 1989, when a new addition at 55 Trinity Street opened and the 1930 building was closed for renovation work. The City Hall Annex facing Trinity Avenue was completed in March of 1989. Atlanta City Hall is located at 68 Mitchell St., S.W., at the southeast corner of the intersection of Central Ave. and Mitchell St. Now serving as the Council Chambers for City Hall, it is used for many public meetings including that of the Atlanta Urban Design Commission; contact them for more information at 404-330-6200 or visit their website for more information.